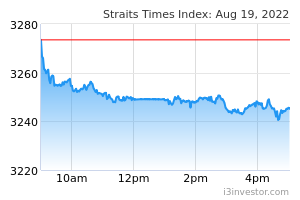 Downgrade to SELL from Neutral, with a lower target price of SGD0.23 from SGD0.39, 15% downside. We resume coverage on GOLDEN AGRI-RESOURCES LTD (SGX:E5H) with a SELL recommendation. While we believe 2019 will be a better year after an extremely weak 2018, we expect earnings to take some time to recover to its previous base of > USD200m. This will likely be after the company revamps its landbank via aggressive replanting and cost management. 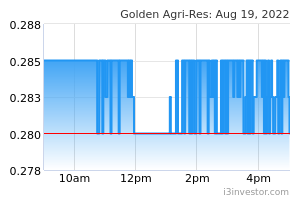 GOLDEN AGRI-RESOURCES LTD (SGX:E5H)'s 9M18 core earnings reversed into the red with USD18.5m of losses, from a profit of USD101m in 9M17. This was mainly due to lower CPO prices (-9% y-o-y), weaker refining margins (1.3% in 9M18 vs 2.5% in 9M17), and losses incurred at its oilseeds division in China as a result of the US-China trade war. Effective tax rates in 3Q18 also ballooned due to deferred tax expenses from the devaluation of the IDR, and amortisation related to revaluation of assets in 2016. Total FFB growth in 9M18 was +6% y-o-y (nucleus & plasma). For 4Q18, we expect a turnaround to profitability, assuming effective tax rates return to normal. This is on continued y-o-y growth in FFB output and lower unit costs, as the bulk of its fertiliser application was completed in 9M18. Management’s guidance for FFB growth in FY18 is 10%, which implies > 20% y-o-y growth in 4Q18. We believe this is possible, as it is coming from a low base in 4Q17. This also implies a 9% q-o-q decline in output, which is seasonal in nature, since peak output is likely to have been in 3Q18. Refining margins should also improve slightly q-o-q, on lower CPO prices, while the oilseed division had already turned around in 3Q18. For 2019 and 2020, we project FFB growth to normalise to 3% y-o-y, slightly below management’s guidance of 5%. We expect slower FFB growth – given Golden Agri’s aggressive replanting programme. Golden Agri intends to replant 10,000- 15,000ha over the next few years (from 5,000-7,000ha pa previously). This is aimed at rejuvenating its tree age profile, which is currently at around 16 years on average. We believe a more significant impact from the aggressive replanting activities will only be seen 3-4 years later. Our CPO price assumptions are USD553/tonne for 2019 and USD632/tonne for 2020. We cut our forecasts by 67-82% for FY18-19, after imputing lower CPO price assumptions (in line with current assumptions) and higher unit cost projections. We also introduce our FY20 forecasts. Given the low earnings base in 2019 post recovery from a weak 2018, we switch our valuation methodology to SOP from P/E. We apply an EV/ha valuation of USD5,000/ha for Golden Agri’s plantation division and a target P/E of 10x 2019 for its downstream division. This is at the lower end of its peers’ range of USD6,000-14,000/ha. However, given its older age profile, we consider the discount appropriate. The downstream target P/E of 10x is in line with its peers’, which fall between 10-12x. Our TP is reduced to SGD0.23 from SGD0.39.